In an effort to support carbon footprint reduction in housing development, one approach is designing energy efficient housing. Issues such as cost efficiency and minimum environmental impact should be thoroughly considered when designing this type of housing. One of concepts found to be cost-effective and to increase the energy performance of a house is the near Zero Energy House (nZEH) concept. This concept enhances the use of natural resources, for example, sunlight exposure, climate conditions, and wind, that can minimize the use of fossil fuel energy. Housing in a tropical climate where sun exposure is year round, such as in Indonesia, can benefit from the nZEH concept. This research aimed to identify design parameters of nZEH and its best practices in tropical climates, including Indonesia. The identified design parameters will be used in the next step of the research, finding a combination of cost optimum design parameters. This study was conducted by consulting recognized experts, which included government, private sector, and academicia, who have expertise in the field of building design and energy. 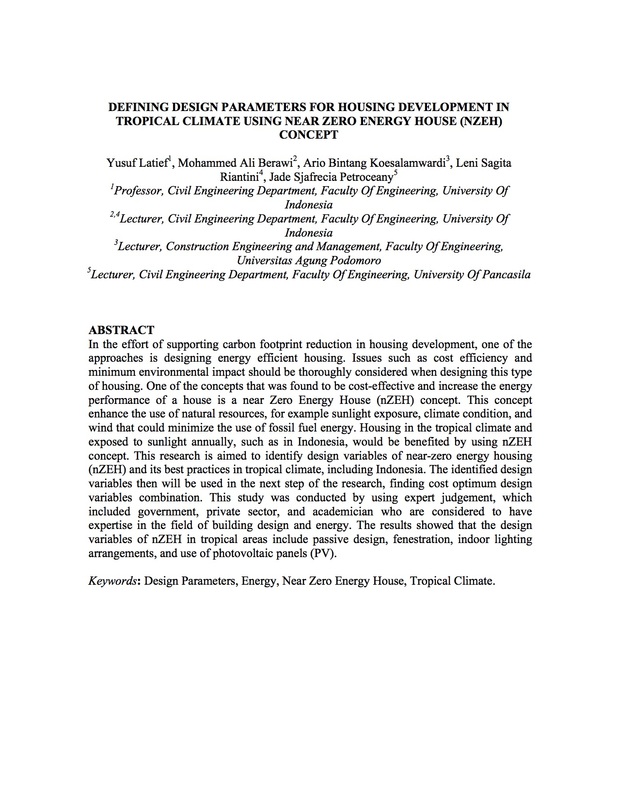 The results showed that the design parameters of nZEH in tropical areas include passive design, fenestration, indoor lighting arrangements, and the use of photovoltaic panels (PV). Latief, Y., Berawi, M.A., Supriadi, L., Herzanita, A., Koesalamwardi, A.B., 2017. Near Zero Energy House (nZEH) Cost Optimum Design Development to Improve Economical Value. Ministry of Research, Technology and Higher Education Republic of Indonesia, Hibah Penelitian Unggulan Perguruan Tinggi 2017 - Final Report.